Original equipment manufacturer (OEM) – 1. An acronym, “Original Equipment from Manufacturer,” refers to parts or components. 2. The companies that build the bikes. 3. – In the automobile industry, the term refers to the industry’s brand names such as Suzuki, Harley-Davidson, Honda, etc., who are federally licensed and who can warrant or guarantee their product. Licensed component manufacturers such as Bridgestone, Brembo and K&N, are usually referred to as OEM suppliers. O Ring – A rubber sealing part. Does not need to be in the shape of an O.
Octane Rating – 1. A rating that indicates the tendency to knock when a fuel is used in a standard internal combustion engine under standard conditions. The higher the octane number or rating, the greater the antiknock qualities of the gasoline. 2. Indicates the ability of a fuel to resist early detonation called knock. Odometer – Device that stores the mileage (distance driven). Usually located on the speedometer. Off-camber Turn – Turn that is banked higher on the inside than the outside. Off-road Bike – Term for a motorcycle designed specifically for off-road use. Off-road helmet – Motorcycle helmet with a chin guard and sun shield but no visor. Ohlins – A manufacturer of high-quality suspension components. Oil Bath – Lubrication by complete submergence into oil. Oil Cooler – Engine cooling system where the engine’s oil is sent through an external radiator to help remove heat from the engine. Oil Dripper – Slang term, refers to the earlier American and British bikes and often still used towards the modern ones. Oilheads – Newer, air and oil cooled BMW Boxer engines. Old Lady – Wife or steady girlfriend of a club member. On the box – A top-three finish that puts a rider on the victory podium. On the gas – When a rider is going very fast. On the pipe – When a rider or bike is going very fast. This expression refers to when a competition bike’s two-stroke engine is operating at optimum rpm. Exhaust pipes for these motorcycles are designed to work best at certain engine speeds. When a motorcycle is on the pipe, it is running at the rpm that gives maximum horse-power. On Rails – Expression when a motorcycle holds a corner extremely well at speed. (The bike felt like it was on rails through that corner). One Percenter (1%er) – Worn by outlaw clubs. Made famous by the media that said 99% of bikers and clubs are law bidding citizens the other 1% is not. One-Off – One-of-a-kind fabricated part. A product or part that is not designed to be mass produced. It can refer to a one-of-a-kind bolt-on or a fully customized motorcycle. Open Class – When referring to street legal sportbikes, open class designates motorcycles with engines that displace more than 800cc in volume. Open cradle frame – Frame without tubes running under the engine. The engine unit bolts into place between the front downtube and the swingarm pivot area as a semi-stressed or stressed member. Original owner – The first owner of the motorcycle who purchases a brand new bike from a dealer. Originals – A member’s first set of colors which are never to be cleaned. Orphan Bikes – Rare bikes that are no longer in production. Otto Cycle – 1. Uses four strokes, of which two can be considered “high power” – the compression stroke and the power stroke. Much of the internal power loss of an engine is due to the energy needed to compress the charge during the compression stroke. 2. The four stroke engine is sometimes called the Otto cycle, in honor of its inventor, Otto Benz. 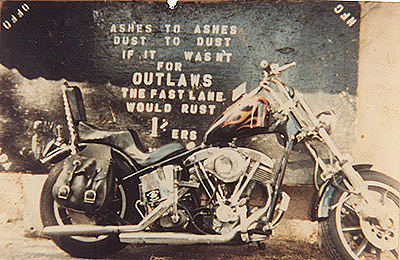 Outlaw – Often associated with motorcycle “gangs” the term actually denotes a motorcycle club that has refused to become a member of the AMA. Hells Angels, Outlaws, Banditos, and similar motorcycle clubs are “outlaw” clubs in this regard. Overbore – 1. To increase the diameter of the cylinder. 2. When you overbore your engine, you drill out the cylinders and then put oversized pistons in the holes, effectively increasing your engine capacity. Overdrive – Transmission gear such that one revolution of the engine produces more than one revolution of the driveshaft. A gear ration of less than 1:1. Overhead Cam System – A system where the cam rides directly on top of the valve steams. Oversquare – Cylinder diameter (bore) greater than the stroke. Also called short stroke. An oversquare (or Oversquaring an) engine will increase/improve torque. Oversteer – The situation that occurs in cornering when the rear of a vehicle tends to skid before the front. Oxidizing catalytic converter – The oxidizing (or oxidation) catalytic converter transforms the hydrocarbons (HC) and carbon monoxide (CO) contained in diesel exhaust gases into water (H2O) and carbon dioxide (CO2). In addition, it oxidizes the nitrogen monoxide (NO) into nitrogen dioxide (NO2). In diesel vehicles, the NO2 released in the catalytic converter oxidizes the residual soot in the particulate filter, turning it into carbon dioxide (CO2) and into nitrogen (N2), which is a non-pollutant component of air.